In a large bowl, mix up all the dry ingredients: almond flour, baking soda, salt, cinnamon. In a medium-sized bowl, mush up the banana, add the eggs, coconut oil, vanilla, and honey. Mix the wet ingredients into the dry, but do it by hand. 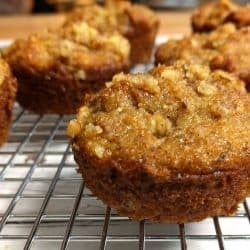 Now I'm new to the Paleo way of baking, but if you've made muffins before, you know where I'm going. Muffins don't like to be overmixed, so I applied the same principle here. Just enough mixing to combine the wet and dry. Stir in the chopped walnuts, but keep a 2 tbsp. back to sprinkle on the tops before baking. Bake for 20 to 25 minutes, until a toothpick comes out cleanly. The smell, when they are baking, is divine, and you will have a sweet reward for very little effort.